KIEV, Ukraine -- I recently met with Ilya Yashin, a Russian opposition leader, political activist and former colleague of the assassinated politician Boris Nemtsov. 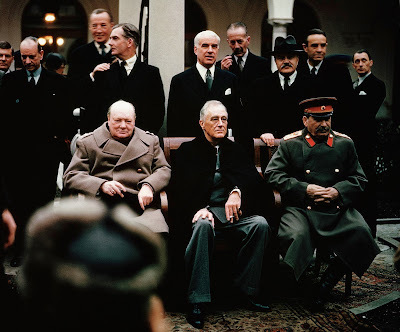 Soviet leader Joseph Stalin (R), American President Franklin Roosevelt (C) and British Prime Minister Winston Churchill (L) seated together during the Yalta Conference, February 4-11, 1945. When I asked Yashin what the West could do to help those brave enough to defy the Russian regime, his main point was that governments and organizations must support Ukraine. The reason is obvious: Russian President Vladimir Putin invaded Ukraine foremost because he was worried that the country's liberal revolution might inspire the Russian people to mount their own Euromaidan. Putin is therefore doing everything he can—including going to war—to demonstrate that toppling the strongman is a bad idea. Thankfully, the West didn't simply stand by while European borders were being redrawn by force of arms for the first time since World War II, and Putin found himself in the cold. Now, however, he may have found a way out of it. In his speech to the U.N. in September, Putin called for a "broad international coalition against terrorism." Comparing ISIS to the Nazis, he demonstrated that his strategy is to make himself a necessary partner to the West in the fighting occurring in Syria, in the same way that the Soviet Union became indispensable to the Allies in their fight to defeat Hitler. Putin also clarified his long-term vision when he praised the Yalta Conference, which occurred at the end of World War II, claiming that it laid "a solid foundation for the postwar world order." It looks like his plan is to create a temporary alliance of convenience with the West in Syria in order to break Russia out of its current isolation. Following Stalin's playbook, Putin hopes that after the Syrian conflict has been neutralized, the main powers involved will meet in a modern version of Yalta to divide the world into spheres of influence. Such an arrangement could give Russia a free hand in the former Soviet space. From Russia's perspective, Ukraine is one of the most important countries in that space. Those who miss the so-called "stable," or at least somewhat more predictable, days of the Cold War should recall that during that era, Eastern Europe's population lived under an oppressive totalitarian system for half a century. One only needs to look at the difficulties of reforming Ukraine today to see just how deep the wounds of that "world order" go. It was in order to finally free themselves from the shadow of Yalta that the Ukrainian people threw out former President Viktor Yanukovych—not to promote chauvinistic "nationalism," as Kremlin propaganda would have people believe. In the wake of the November 13 attacks in Paris, many in the West may have forgotten about Ukraine. Putin certainly hasn't, though he's gambling that everyone's eyes are fixed on Syria and Iraq. Shortly before the attacks, violence erupted in the Donbas again after a period of relative calm. And recently, Ukrainians reported that Spetsnaz units were once again operating at the front lines, Russian irregular forces have been using heavy weapons and several Russian artillery and motorized units were transferred to the Ukrainian border. Russia also announced that it was sending yet another "humanitarian convoy" into the Donbass, usually a bad sign. Additional airborne units have also been deployed to Crimea. In both Syria and Ukraine, Putin is using similar tactics—creating military facts on the ground (or in the air) and thus forcing those who want peace to take his position into consideration. This doesn't necessary mean that Putin is planning a new massive offensive in Ukraine. A much less costly alternative would be to continue the slow war of attrition that Russia has been conducting since its first big mechanized intervention in April 2014. Having failed to knock out Ukraine with one big punch, Putin hopes to kill it with a thousand cuts. One small advance here or a bomb there has Ukraine's leaders distracted from carrying out critical reforms; separatists keep Ukrainians on edge, while the main Russian army works as a deterrent behind the lines and the threat of "real war" looms. This has the effect of tiring potential investors and pressuring Ukraine, via Western politicians, to concede to the rebels' demands, such as allowing them to remain armed in exchange for honoring other parts of the Minsk agreement. As long as Russia's regular forces have escalation dominance, they will likely continue this pattern. Western strategists should therefore ensure the Ukrainian Army has plenty of advanced anti-tank weapons to deter Russian armor, making a true cease-fire more likely. Ukraine also needs constantly updated satellite imagery that the West can provide to stay ahead of Russian movements. Above all, Ukraine needs to push forward with its reforms. The West can help with financial assistance but only Ukraine's leaders can change their country. In doing so, they will not only help themselves but also reformers like Yashin who can then show the Russians that Putin's narrative of "authoritarianism or chaos" is false. In addition, the West needs to be vigilant of new Russian propaganda offensives. The idea of "dividing and sharing" the world may sound attractive to some, but with Putin it only means that the strong rule the weak, and that a unique set of rules and norms should apply across large parts of the Eurasian continent. Everyone who remembers the true tragedy of Yalta should reject its resurrection. Putin has been following the Stalinist playbook, and the "international anti-terrorism coalition" gambit may very well be a red herring to distract the world from Ukraine. By appearing to take on ISIS he is burnishing his "anti-terrorist" credentials while stabilizing and supporting his Syrian ally and softening European resolve on behalf of Ukraine. Fortunately, Russia's own economic wherewithal is sinking concurrently with his plans, while Ukraine's military capability has been growing. What remains absolutely crucial for Ukraine is the fight against corruption, the reform of government, and economic growth. The truly knowledgeable national security experts both in the U.S. and EU fully understand Putin's game-plan and disinformation, but the new anti-Islamic tide (though entirely justified in its fears) is too obsessed with terrorists to comprehend Ukraine's critical importance to Europe's and the West's future. Preserving Europe or the U.S. from terrorism does not need Russia's support and standing with Ukraine is not inconsistent with fighting Islamic radicalism.